The first five months of 1977 have been a time of rapid progress in the work of Dr. Brian O’Leary, myself and our co-workers in many locations. Concluding a most pleasant and productive sabbatical year as Hunsaker Professor at M.I.T., in the Spring I gave there a seminar series titled “Spaceflight via Maxwell’s Equations.” This series went into research-monograph detail on the subject of electromagnetic mass-drivers, covering acceleration, guidance, mass-optimization and applications. The seminar-series is the basis for a technical book now in preparation. During these months a working model of a mass-driver, with two-meter acceleration length, was built by a volunteer group at M.I.T. with the guidance of Dr. Henry Kolm and myself. The model was tested successfully at the 1977 Princeton Conference (see below). An initial research grant to Princeton and M.I.T. was given in April by the Propulsion and Power Division of the Office of Aeronautics and Space Technology (OAST) at NASA Headquarters. A considerably larger grant, from NASA HQ in cooperation with NASA-Lewis Research Center (LeRC) is in an advanced stage of discussion for the year beginning Sept. 1977. The goal of that research program is a spaceflight-qualified mass-driver reaction engine, to be assembled in space from the Shuttle in the 1980’s. Given funding, the intermediate goal will be a 10-meter, synchrotron-mode driver, in vacuum with a superconducting carrier, targeted for 1,000 gravities acceleration and a peak velocity of 1,000 kilometers/hour. The end-products of this line of research are intended to be mass-driver reaction engines able to lift 850-ton payloads from low earth orbit to lunar orbit, using surplus Shuttle external tankage as reaction mass, mass-drivers as asteroidal transfer engines, and as lunar materials launchers. One job opening in this program is expected to exist at Princeton as of Sept. ’77, for a fresh Ph.D. with strong EE, Physics and Aerospace preparation. 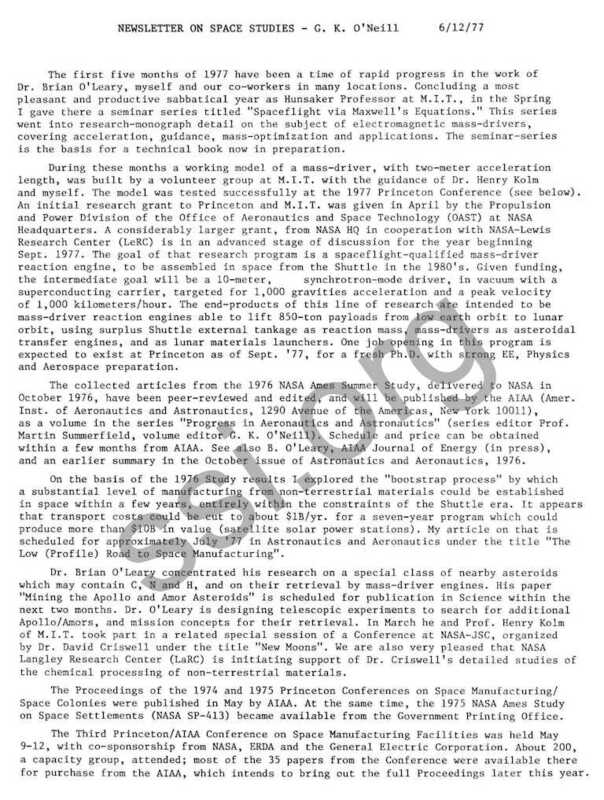 The collected articles from the 1976 NASA Ames Summer Study, delivered to NASA in October 1976, have been peer-reviewed and edited, and will be published by the AIAA (Amer. Inst. of Aeronautics and Astronautics, 1290 Avenue of the Americas, New York 10011), as a volume in the series “Progress in Aeronautics and Astronautics” (series editor Prof. Martin Summerfield, volume editor G. K. O’Neill). Schedule and price can be obtained within a few months from AIAA. See also B. O’Leary, AIAA Journal of Energy (in press), and an earlier summary in the October issue of Astronautics and Aeronautics, 1976. On the basis of the 1976 Study results I explored the “bootstrap process” by which a substantial level of manufacturing from non-terrestrial materials could be established in space within a few years, entirely within the constraints of the Shuttle era. It appears that transport costs could be cut to about $1B/yr. for a seven-year program which could produce more than $10B in value (satellite solar power stations). My article on that is scheduled for approximately July ’77 in Astronautics and Aeronautics under the title “The Low (Profile) Road to Space Manufacturing”. Dr. Brian O’Leary concentrated his research on a special class of nearby asteroids which may contain C, N and H, and on their retrieval by mass-driver engines. His paper “Mining the Apollo and Amor Asteroids” is scheduled for publication in Science within the next two months. Dr. O’Leary is designing telescopic experiments to search for additional Apollo/Amors, and mission concepts for their retrieval. In March he and Prof. Henry Kolm of M.I.T. took part in a related special session of a Conference at NASA-JSC, organized by Dr. David Criswell under the title “New Moons”. We are also very pleased that NASA Langley Research Center (LaRC) is initiating support of Dr. Criswell’s detailed studies of the chemical processing of non-terrestrial materials. 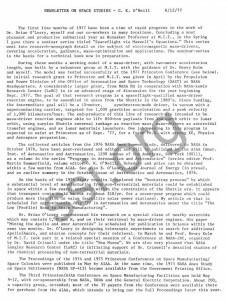 The Proceedings of the 1974 and 1975 Princeton Conferences on Space Manufacturing/ Space Colonies were published in May by AIAA. At the same time, the 1975 NASA Ames Study on Space Settlements (NASA SP-413) became available from the Government Printing Office. The Third Princeton/AIAA Conference on Space Manufacturing Facilities was held May 9-12, with co-sponsorship from NASA, ERDA and the General Electric Corporation. About 200, a capacity group, attended; most of the 35 papers from the Conference were available there for purchase from the AIAA, which intends to bring out the full Proceedings later this year. The mass-driver model was tested successfully several times per day at the Conference; although not yet up to full carrier current and precision-timed, it already produced more than thirty gravities of acceleration, exceeding the ultimate expectations listed in my original 1974 paper describing the mass-driver concept. Television crews from WGBH-NOVA, planning a one-hour special in January 1978, and from BBC-TV, planning three one-hour specials for the Spring of 1978, attended the Conference and thoroughly documented the mass-driver tests. Our keynote speaker this year was Congressman Donald Fuqua, and Ambassador Peter Jankowitsch, Chairman of the United Nations Committee on the Peaceful Uses of Outer Space, delivered an important address at the Conference. With the continued cooperation of AIAA, it is expected that the next (1979) Princeton Conference will be explicitly international in character. During these months Dr. O’Leary, Dean Stephen Cheston of Georgetown and I have completed the assembly of the Advisory Panel for the U.S.R.A. (Universities Space Research Association) Task Group on Large Space Structures, which I chair. This advisory panel combines representation from a number of constituencies, including engineering, natural sciences, life sciences, humanities, organized labor, the electric utility industry and the investment community. The first meeting of the Panel will be held July 25-26 in California, timed for briefing on the results of the 1977 NASA Study (see below). The 1977 NASA Ames Study on Space Manufacturing/Space Settlements will be approximately four times the size of the 1976 Study, with over fifty full-time participants. Funding is from the NASA Life Sciences and OAST divisions. Participants are also being sent by several NASA Centers, aerospace corporations, and the General Electric and General Motors corporations. Dr. John Billingham, Wm. Gilbreath and Ben Zeitman of Ames, and Dr. O’Leary, have organized the Summer Study in cooperation with me as director. Study topics will be closed ecosystems, habitat design, asteroidal resources, mass-drivers, and chemical processing of non-terrestrial materials. All places on the Study are now filled; the results will be presented to the staff and general public in the NASA-Ames Auditorium on Aug. 2nd; the Ames public information office should be contacted to check for changes of date or location. A parallel but separate Study, conducted by Mr. Stan Sadin, head of Advanced Planning for OAST, will consist almost entirely of NASA personnel and will consider program planning options for the realization of space-manufacturing. A closely related Study, emphasizing connections between space manufacturing and space science, will be conducted by Prof. James Arnold of UCSD-LaJolla with NASA-JSC support, immediately after the conclusion of the Ames Study. The International Astronautical Federation annual meeting will be in Prague, Czech­oslovakia Sept. 25-0ct. 1. Dr. Jerry Grey has organized for it a five-session Symposium on Space-Based Industry. Dr. Alain Dupas of the French National Center for Space Research and I will co-chair one of the sessions, on Non-Terrestrial Mining and Delivery Systems. The NASA Space Settlements Exhibit, built last year under the direction of Mr. Michael Przekop of Ames for the Kennedy Space Center Bicentennial exhibition, is now on view through October at the California Academy of Sciences in San Francisco. I will speak at its dedication, on Saturday evening, July 16th, at the Palace of Fine Arts in San Francisco. A lecture is also scheduled at the B.I.S. in London for Sept.29th. In February I lectured in Saudi Arabia at the invitation of the Arabian-American Oil Company and the Saudi University of Petroleum and Minerals. Among television interviews I should note “A.M. America”(Jan. 77), “90 Minutes Live” (CBC, Mar. 77), “Tonight” (J. Carson, June 77), “Tomorrow’s World” in England over BBC-TV the week of Sept. 26, “60 Minutes” (Dan Rather) in the Autumn of ’77, and the longer special programs referred to earlier, scheduled for 1978. My book “THE HIGH FRONTIER, Human Colonies in Space” was published by the Wm. Morrow Co. in late January, and is presently in the fourth printing. Translations into several languages, including French, German and Japanese, are in progress; the U.K. edition was published by Jonathan Cape last month. An unexpected problem has come up in the case of the U.S. edition: very few bookstores stock it, apparently because it fits no standard pre-existing category. I would appreciate those interested in bringing it before the public visiting their local bookstores not only to order the book but to urge that it be stocked and displayed. During the entire academic year beginning in September 1 77 I will be teaching graduate Electricity and Magnetism at Princeton. A number of excellent students inter­ested in a graduate program in space studies have surfaced; others we may not know about are urged to correspond with Dr. O’Leary or myself, so that we may advise them in individual cases on whether to apply to the Graduate School in Physics, Engineering or another specialty. Readers of the Newsletter over the past three years have often commented on the fact that it is sent at no charge. I prefer that policy and intend to continue it, only requesting that address changes be sent in and that readers distribute it as widely as possible by local copying. The costs of printing and mailing this Newsletter are obtained from donations and personal funds. As our work has grown, though, a serious problem has grown with it. We devote practically all of our research grant money, considerably as it has grown, to materials, labor and other costs directly connected with the technical research. Departmental restric­tions prevent our increasing our staff beyond one very overworked secretary, and as a result I devote considerable time to typing nearly all my own letters myself, and to other secretarial and clerical work (for example, this Newsletter is my own typing, and may show the fact). Possibly through the mechanism of the new Institute now being formed, I would very much like by September 1 77 to bring in a full-time secretarial assistant. We cannot ask government funding for such a position, and I would like to find whether there is broad-based support for providing the necessary salary through small or larger tax-deductible contributions from the several thousand readers of this Newsletter. Even one dollar contributions would be appreciated, as would anything larger. Those interested will earn my thanks by sending in the short form below. I acknowledge with particular gratitude the contributions made in support of our work during the past several months by Mr. William O’Boyle and Mr. David Hannah. It is indeed a great pleasure to report so much progress, and there is every reason to believe that our cooperative effort will be equally exciting in the months ahead. Institute of Space Studies, Inc. I would be interested in contributing $ to a non-profit tax-deductible institution, toward support of one year’s secretarial work or equipment needs of the Princeton space-studies group, not obtainable from University or Government sources.